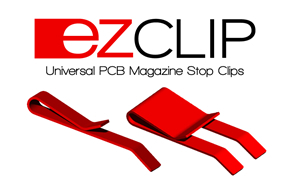 2014/11 - Blog - Count On Tools, Inc.
Count On Tools Inc. (COT), a leading provider of precision components and SMT spare parts, introduces the new ezCLIP universal stop clip for PCB magazine racks. The ezCLIP system was created to allow electronics manufacturers who manually load/unload PCB magazine racks a simple way to distinguish required spacing between boards and to prevent damage on boards with taller components. At this time, companies who operate without the ezCLIP system must manually check each board when loading the PCB magazine rack to ensure that they are spaced correctly. Failure to confirm correct spacing can lead to damaged components that are critical to the board’s operation. With the ezCLIP installed on the PCB magazine rack, companies can quickly identify which card guides should be skipped as they prevent boards from being inserted. This allows for faster set-up times for the production run and swift manual loading and unloading of the boards during assembly, reflow, rework, inspection and more. The ezCLIP system offers the lowest cost option for safely marking board spacing on PCB magazine racks for quick loading with the proper component height tolerances. Single lane ezCLIPS are available in packs of 50 for $100.00. This package would allow users to disable 25 lanes of the PCB magazine rack. Double lane ezCLIPS also are available in packs of 50 for $150.00. The double lane clips allow users to disable 50 lanes of the PCB magazine rack. The ezCLIP is manufactured from high quality spring steel and coated for long life use. Installation is simple; just push the clip over the PCB magazine rack slot that needs to be skipped. The bright finish is a visual cue that the cardguide slot is not available and is easily distinguishable across a variety of electronics manufacturing operations.